These Big Wings from Gators Dockside Tampa are Perfect for the Big Game! The time is approaching for what could be the sporting event of the year. The New England Patriots and the Los Angeles Rams will battle it out on Sunday, February 3 to determine this year’s Super Bowl champion. If you’re hosting a party for this epic event, Gator's Dockside in Tampa has the perfect deal to turn your party into a success. There are several things that can make your Super Bowl party one that people will want to attend again next year. As long as you have a television all your guests can watch the game on, then the next item on your list should be the food. That’s where Gator’s Dockside in Tampa can really help in making life easy for you. 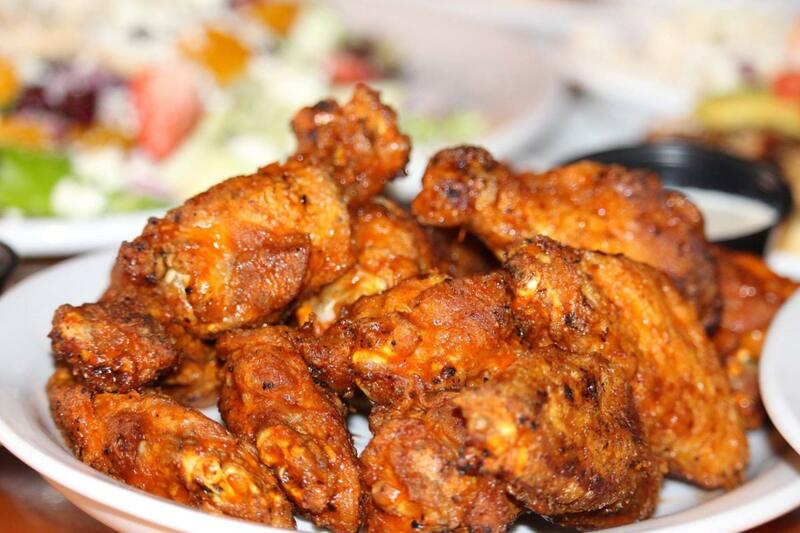 Wings are a great appetizer, entrée, or finger food, which make them one of the best Super Bowl foods of all time. Any time between now and February 2, you can put in your order for a 50 or 100 pack of wings. The wings will be made fresh and hot on Super Bowl Sunday when you can pick them up. Plus, when you pre-order, you’ll get 15% off your entire order! Not planning on partying but still want to watch the Big Game and enjoy great food? Visit Gator's Dockside where there are 25 televisions, ensuring you have a great view of the game no matter where you sit. The atmosphere is fun and friendly, and the food is fresh and made with quality ingredients. Menu items include wings, burgers, ribs, salads, and more. On Super Bowl Sunday, Gator’s Dockside will be open from 11 a.m. to midnight, so you’ll have plenty of time to enjoy the food and the friendly service before the crowds get there. If you stay for the game, you’ll have the opportunity to meet and spend time with other Tampa locals who share your interest in the sport. If you want a place to watch the game and get your fill of great Super Bowl foods, the doors at Gator's Dockside in Tampa will be wide open. If you’re throwing a party, don’t take on the stress of making all the food yourself; pre-order a pack of wings from Gator's Dockside in Tampa instead. For a small get-together, the 50-pack is perfect, but if you’re planning a larger party, make sure to order the 100-pack. 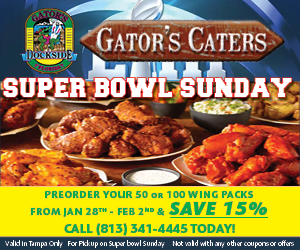 This deal is already available to pre-order, so order your wings now by calling Gator's Dockside at (813)341-4445 and get 15% off your entire order! Find more great restaurants in Tampa by registering on 813area, your free, local guide to the Tampa Bay area!